While many of the approximately 100 sunbird species have colorful names reflecting their good looks—violet-tailed, blue-throated, ruby-cheeked, purple-banded, and scarlet-tufted, among others—a couple of types just cut to the chase to state the obvious: the superb sunbird and the beautiful sunbird. The latter will be part of the Zoo’s new Africa Rocks experience, so that is the species that will be flushed out here. Sunbirds are strongly sexually dimorphic, with males sporting flashy, iridescent plumage and females more subdued in coloration. Like hummingbirds and the honeyeaters of Australia, sunbirds feed on nectar, and they share some physical similarities, but they are not related. Beautiful sunbirds are tiny, barely reaching four inches in length, with the breeding male’s “tail streamers” adding another few inches to its body length. I’m not a hummingbird. 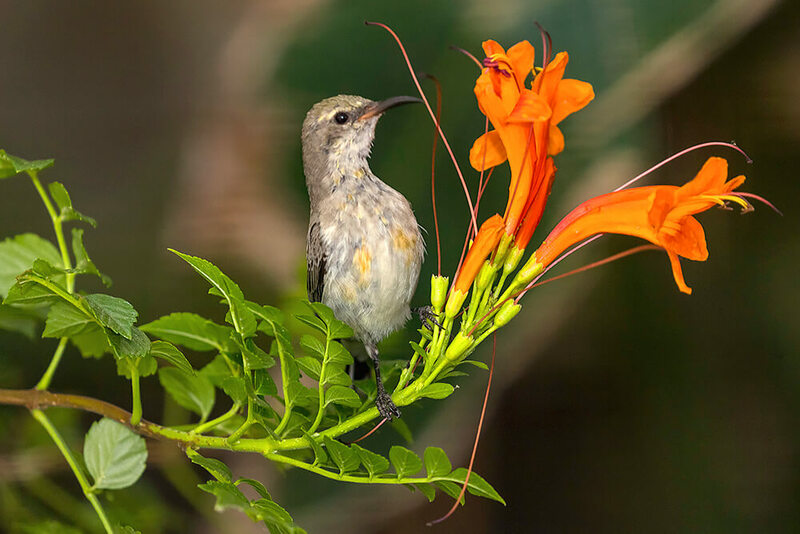 While the beautiful sunbird of the Old World fills a similar ecological niche as the New World hummingbird, the groups are only distantly related. The beautiful sunbird and its fast and fickle feeding style resembles the hummingbird with its small, colorful, compact body, its ability to hoover, and its long, downward-curving bill, but they rarely hang in space to feed and instead perch on branches or suspend from flowers while consuming nectar. Furthermore, the beauties extract nectar by sucking with their tubular tongue, while the hummers lick the nectar from the flower. Their relatives include spiderhunters and flowerpeckers. A day in the life: These diurnal birds spend much of the day seeking blooming plants, especially along forest edges and clearings, which may contain more feeding opportunities. Beautiful sunbirds require a steady stream of energy intake to meet their metabolic needs. They also spend time preening their feathers and bathing in birdbaths or natural water sources. Beautiful habitat. Beautiful sunbirds are found in beautiful habitats of West and East Africa. These birds flit about savannas, semi-arid or dry forest, wooded grasslands, riparian areas, and even villages and gardens. Food groups: Beautiful sunbirds have a well-rounded diet of nectar, insects, spiders, and the flesh of fruits and berries. Experts say these birds visit flowers of more than 20 different plant genera, including acacia, aloe, jacaranda, and lantana. They typically forage singly and occasionally in small groups. Males chase intruders away from nectar sources in their territory. At the Zoo, chicks devour spiders, crickets, mealworms, wax worms, fruit flies and other small insects. When the parents feed the chicks, they get spiders exclusively, while chicks that are hand-reared devour a variety of insects. A few years ago, the Zoo had a parent-reared chick and staff had to collect up to 200 spiders per day for the parents to feed the little one! It was very taxing on everyone, so now the Zoo hand-rears the chicks to ensure they get a well-rounded (and accessible) diet. 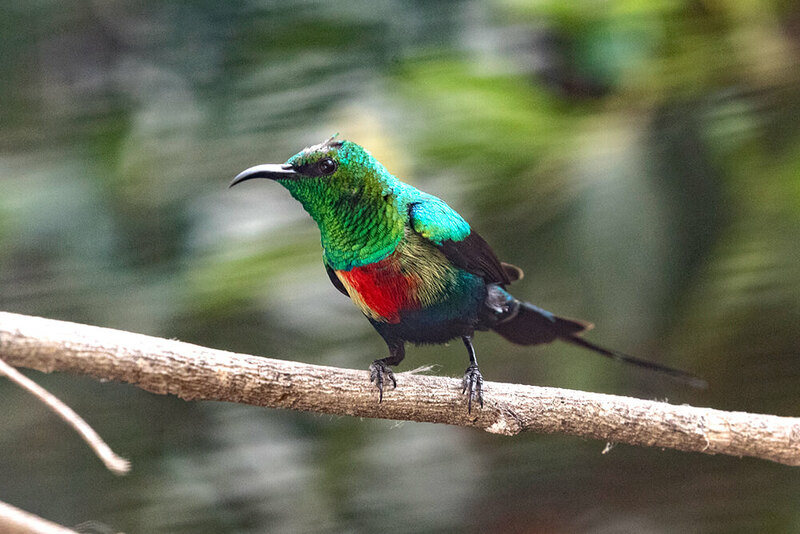 Beautiful sunbird adults receive artificial nectars containing carbohydrates, proteins, vitamins, and minerals (especially calcium), along with fresh fruit and an assortment of insects. It’s a crime. Beautiful sunbirds even go so far as to steal nectar, using their sharp bill to puncture the base of the flower without touching the pollination structure. This type of nectar robbing violates nature’s “agreement” between flower and pollinator. It’s a crime against nature! Hanging at home. Nests are constructed by female sunbirds. They are compact, purse-shaped shelters suspended from tree branches with a single central entrance. A variety of fibers are used in nest construction, including bark, twigs, dried grass, leaves, vegetable down, plants stems, feathers, and snakeskin. It is tightly bound with spider’s silk, especially at the entrance and where it is attached to a branch. The nests are sometimes “decorated” with lichen, while some have a “porch” or trailing “beard” of vegetation hanging from the bottom. The inside may be softened with feathers, vegetable down, or even human litter like paper and lightweight plastic. Within this shelter, a female will lay a clutch of one to two fragile eggs, which she will incubate for about two weeks. Nesting instinct. Courtship is an elaborate affair. Male displays are extravagant, with much singing and “dancing” to get a female’s attention. Males may chase down the females until they settle on a perch. In addition to a bright red breast band, flanked by yellow on each side, and iridescent plumage, males also sport “tail streamers” or elongated tail feathers to further entice females. Once she looks his way, he spreads his wings and raises his tail, flicking his wings while wooing her with song. If he’s lucky, she will quiver her wings back at him. Breeding takes place during the rainy season, so insects will be plentiful to feed the chicks. Males are territorial, chasing away rivals; he may court more than one female at once. The brunt of parental duties rests with the females, who build the nest, incubate eggs, brood the young and feed the chicks. The male chimes in with attending the nest and helping feed the chicks. Tiny hatchlings may have short, gray down and yellow stripes along the jawline. They are likely fed exclusively spiders. Fledging period is 14 to 18 days, and they gradually venture farther from the nest. Parents continue to feed the youngsters for about two weeks. Call songs: Beautiful sunbirds vocalize to others in their social group. Sunbirds in this genus Cinnyris have more complex songs than other sunbirds’ simple ones. Their varieties of vocalizations indicate arrival at foraging sites and defense of territories, advertise to mates, and communicate with offspring and conspecifics. Watch out! Larger birds prey on these pint-sized gems, and sunbird eggs may be eaten by snakes. Our beauties. Visitors can observe these beautiful birds at Africa Rocks at the Zoo and Hidden Jungle at the Safari Park. Like most sunbird species, the beautiful sunbird is rare in zoos. These avian gems were first exhibited at the San Diego Zoo in 1968, and the first successful breeding occurred in 1992. San Diego Zoo is one of the few zoos to successfully raise these birds from eggs, both parent- and hand-reared. New husbandry techniques are continually being developed to help this species thrive. Beautiful sunbirds are common and widespread throughout their range, where habitat is suitable. They are flexible and adaptable, even making use of human-altered areas like gardens. The International Union for Conservation of Nature Red List of Threatened Species lists them as species of Least Concern, with a stable population trend. However, it is important to conserve wild habitat and prevent illegal forestry and severe habitat fragmentation. San Diego Zoo Global is committed to leading the fight against extinction. Together, we can save and protect wildlife around the globe. Sunbirds are related to spider hunters of the genus Arachnothera found in Asia. Beautiful sunbirds may limit incubation times during the day to prevent the embryos from overheating. While the life span for beautiful sunbirds is unknown, other sunbird species are quite long-lived, like the amethyst sunbird that survives for at least 16 years. Other sunbird species live two to eight years. After breeding, beautiful sunbird males molt into a duller plumage, more closely resembling females. Beautiful sunbirds are adaptable, even using human-altered habitats like gardens. Sunbirds may join other birds to mob potential predators. These birds look at their reflection in mirrored surfaces and windows.